The work of Verónica Artagaveytia is a search for matter, a need to express and multiply–art and life in a profoundly fertile interweaving. Veronica is her work and Veronica’s work is her life. And it’s not about self-references or autobiographical quotations, life and art are placed in a third territory, to which one arrives by journeying in a spiral ascent. She started as a sculptor, basically in metal, creating large sculptures or “mini-sculptures for portable use,” the anti-jewels, and the design of basic garments in cotton. She was one of the first performers in the post-dictatorship ebullient cities of Montevideo and Buenos Aires, from 85 to 93, and with her friend/curator Alcides Martinez Portillo they created the collective VAAMP, pioneer in video performance. 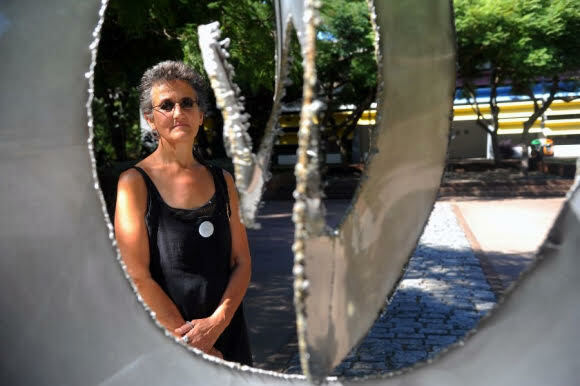 With a sample at the National Museum of Visual Arts (HABAEVA, May 2017), she begins a large-scale form of sculpture and in the summer of 2019, one of her works, which is being created in Italy, will be placed in the sculpture park of the Atchugarry Foundation (Maldonado, Uruguay).